High dose rate (HDR) endobronchial brachytherapy is a palliative treatment for symptomatic airway obstruction by malignant tumours. We report a novel use of HDR brachytherapy for treating non-malignant bronchial obstruction. The patient had a metal stent placed in a reconstructed airway after a bronchial tear to ensure patency. Granulation tissue formation in and around the stent caused symptomatic occlusion of the airway, necessitating multiple laser applications. A single treatment of HDR brachytherapy (1000 cGy) was delivered following laser therapy. The patient remains well 15 months after treatment with no evidence of recurrent granulation tissue formation on bronchoscopy. HDR brachytherapy is an effective treatment for non-malignant airway obstruction. High dose rate (HDR) endobronchial brachytherapy is considered a palliative technique for alleviating dyspnoea resulting from major airway obstruction by primary and secondary malignant tumours.1 2 It has the advantage of delivering a high dose of radiation over a short period of time to the obstructed area without significantly affecting the adjacent lung parenchyma. We present the successful use of HDR brachytherapy in a patient with non-malignant airway obstruction caused by granulation tissue formation around a bronchial stent. A 19 year old man was involved in a motor vehicle accident and suffered multiple injuries including brain contusion and coma, multiple fractures in both legs, and chest contusion. He was initially admitted to the intensive care unit in another hospital and placed on mechanical ventilation for 4 weeks. Three months later he was referred to our pulmonary department with atelectasis of the right lung. Bronchoscopic examination revealed complete obstruction of the right main bronchus by membranous fibrotic tissue, thought to be secondary to a bronchial tear. The tear was probably just at the area of take off of the right upper lobe bronchus and therefore caused complete atelectasis of the right lung. Nd:Yag laser treatment was applied and the bronchus was completely reopened. Tissue obtained from the area of obstruction showed hyperplastic mucosa with granulation tissue. Subsequent bronchoscopies, however, revealed recurrent obstruction of the bronchus with partial collapse of the airway. A metal Wallstent (20/10 mm) was inserted and patency of the airway was restored. Several weeks later, however, the patient again presented with dyspnoea and bronchoscopic examination again showed granulation tissue formation around the stent with occlusion of the airway. Multiple laser applications (eight sessions) were required over a 3 month period with alternating improvement and worsening of the clinical condition. Pulmonary function tests showed mixed obstruction and restriction varying from vital capacity of 50–60% predicted. At this point the therapeutic options available were either surgical bronchoplasty or removal and exchange of the stent; both were considered unsatisfactory by us and by the patient who had just recovered from prolonged hospitalisation and refused major surgery. With the approval of the local Helsinki Committee we decided to treat the patient with HDR brachytherapy in an attempt to prevent regrowth of the granulation tissue obstructing the airway. The procedure was fully explained to the patient who then signed a detailed consent form. The procedure was performed under sedation in the ambulatory bronchoscopy unit according to a modification of the protocol in use for malignant disease. An Olympus P30 bronchoscope (Olympus, Japan), positioned just above the stent, was used to visualise the airway. Nd:Yag laser was applied (total energy 2300 joules) to clear the granulation tissue, which involved mainly the distal portion of the stent. Under direct fluoroscopic guidance an HDR brachytherapy catheter (4.7 Fr) was passed through the metal stent and secured externally to the patient's nose (fig 1). The bronchoscope was removed and the patient was transferred to the radiation therapy unit. At simulation a single dose of 1000 cGy was prescribed to a distance of 1 cm from the centre of the source with a margin of 1.5 cm from the proximal and distal ends of the stent. Treatment planning was performed with the CadPlan BT brachytherapy planning system (Varian Medical Systems, Palo Alto, CA, USA). The treatment was delivered with the Varisource HDR brachytherapy remote afterloader with an iridium-192 source (10 Ci nominal activity). Simulation radiograph showing HDR catheter with a dummy source to simulate iridium-192 source positions. Repeated bronchoscopies were performed 3, 6 and 12 months after the procedure. The airway was found to be patent, with relatively smooth mucosa in and around the stent. Clinically, the patient is asymptomatic except for a mild occasional cough. Recent pulmonary function tests showed mild restriction with forced vital capacity (FVC) 83% predicted, forced expiratory volume in one second (FEV1) 77% predicted, total lung capacity (TLC) 88% predicted, and normal transfer factor. The chest radiograph showed well inflated lung fields bilaterally with a metal stent in the right main bronchus. Based on this experience we suspected that a similar mechanism of response to injury may play a role in the proliferation of the granulation tissue around the bronchial stent in our patient and that it would therefore be treatable by radiation therapy. HDR brachytherapy is a very suitable technique for treating benign diseases for two main reasons. Firstly, the volume treated and dose received outside this area is accurately defined in three dimensions by the computer planning system. Secondly, the treatment can by delivered in a single application over a few minutes with minimal toxicity. After performing the procedure we found the report by Kennedyet al 7 which described a similar approach in two patients with lung transplants who developed hyperplastic bronchial obstruction at the site of the anastomosis in whom balloon dilatation, laser application, and stent placement had been unsuccessful. They used a lower dose (3 Gy) than us although in one patient two sessions were required. One patient had died from an unrelated cause but the airways remained patent in both patients 7 and 9 months after the procedure. This case demonstrates the successful use of endobronchial HDR brachytherapy in preventing formation of granulation tissue in reaction to a bronchial stent. If our assumption is confirmed, this treatment modality could be applied to other malignant conditions as well as non-malignant airway obstruction, as suggested by Phillips.11 It may also be useful in patients with subglottic stenosis resulting from granulation tissue regrowth following laser therapy. (1996) Endoscopic brachytherapy. Chest Clin North Am 6:293–304, . (1998) High dose endobronchial brachytherapy: results and complications in 189 patients. Eur Respir J 11:162–168, . (1998) Radiation treatment of benign disease. in Principles and practice of radiation oncology. eds Perez CA, Brady LW (Lippincott-Raven, Philadelphia), 6th ed. pp 2167–2185, . (1952) Roentgen therapy in some non-malignant conditions. Radiology 59:225–231, . (1968) Results of prophylactic postoperative irradiation in 1300 cases of pterygium. Am J Roentgenol 103:723–730, . (1997) Catheter-based radiotherapy to inhibit retenosis after coronary stenting. N Engl J Med 336:1697–1703, . (2000) High dose brachytherapy to prevent recurrent benign hyperplasia in lung transplant bronchi: theoretical and clinical considerations. J Heart Lung Transplant 19:155–159, . (1974) Radiation-induced head and neck tumours. Lancet i:277, . (1999) Radiation therapy to prevent coronary artery restenosis. Semin Radiat Oncol 9:134–143, . (1996) High dose intracoronary radiation for inhibition of neointimal formation in the stented and balloon-injured porcine models of restenosis: angiographic, morphometric and histopathologic analyses. Int J Radiat Oncol Biol Phys 36:777–788, . 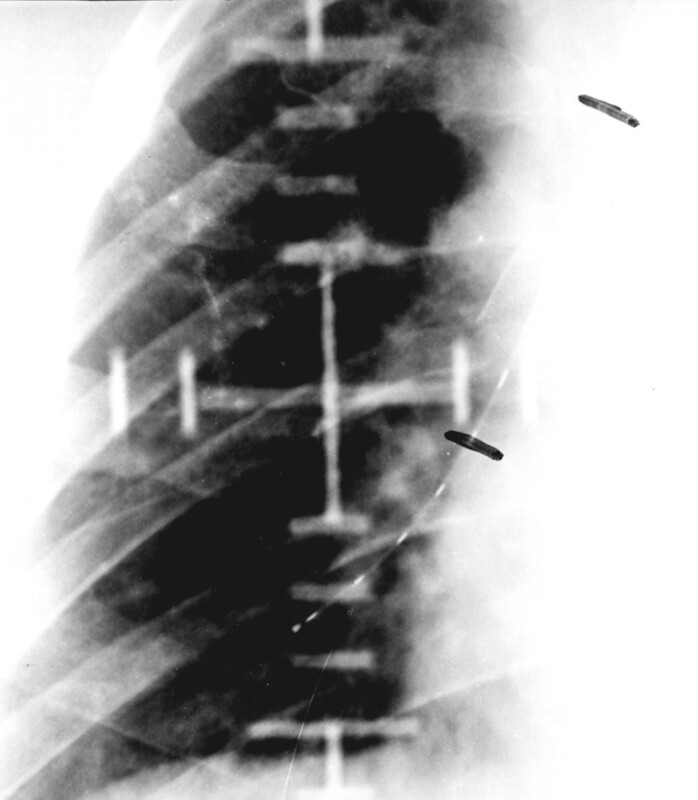 (1998) Stenting therapy of stenosing airway disease. Respirology 3:215–219, .